Les Presento al Mr. and Mrs. Martinez!! Here in Mexico they don’t see religious ceremonies as legal, so we got married civilly first and then took our 3 hour journey to the LDS Temple in Guadalajara, Mexico. There we were sealed for time and through all eternity. I am so grateful that the sealing power is on the earth today. Now we have the opportunity to be together forever! What a wonderful experience it was to be in the temple with my parents and a few of my siblings. Also when we walked into the sealing room, there were some friends of Jose from Aguascalientes. 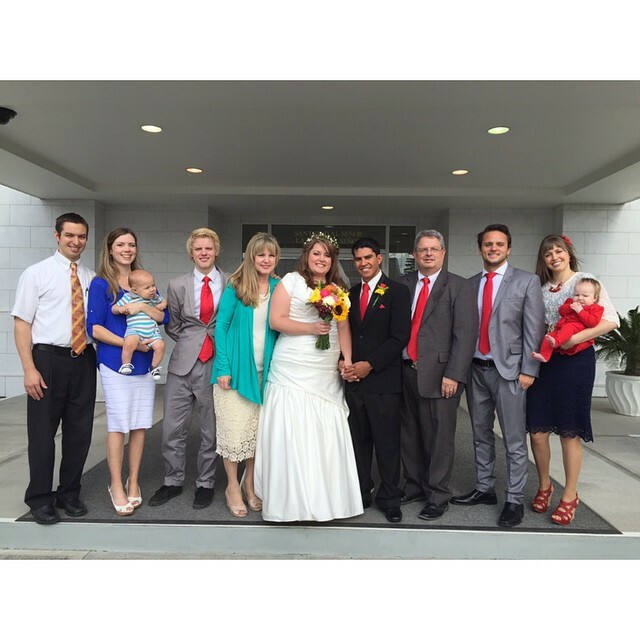 They were in the temple that day randomly so they were able to come and witness the sealing. It was so nice to have someone there from Mexico. Before the ceremony, I had a few minutes by myself in the bride’s room. I sat there and enjoyed the spirit of the temple. As I sat and pondered I thought of all those who couldn’t attend my wedding, but wanted to. I am so grateful for my loving family. For their love and support for Jose and I in this new adventure. I also thought of those who already passed on from this life. My mom in particular. Without getting too personal with the spiritual experiences I had in that room, I will say this…God allows for your loved ones who have died to join you on your own special occasions. I know that my mom was with me the in temple. I know that she loves Jose and is so happy for us. I also know that she enjoyed the reception later that night! Now that we’re married and my family has gone back to the states, real life begins! We are renting a little house in a small town with about 200 people in it. It is just a short distance away from Jose’s family. There we have a kitchen, a bathroom, a bedroom, and a storage area. It’s small, but we love it. It is the perfect size for us. We are also so blessed because we have a nice piece of land on the side of the house where we can plant a garden! The front yard has a few flowers and I am looking forward to planting more. The house is mostly blue. I am so in love with this house. My kitchen is yellow and has a window that looks out into the front garden. Right as you walk into the house there is a roofless hallway. Each night we get to see the stars right from our home. Seriously, it is so romantic. We have no internet, and have concrete floors, but we have each other and plenty of projects to keep us busy around the house. Tomorrow we start to teach English in the same house that we hold our church meetings in. So far we have 5 people who are in the class. I’m so excited to see how things grow. The school, the church, the garden, our family! All of it! Until next time! Do something today that stretches you! Yay! Congratulations! As permits I would love to see more pictures of what your life is like, home, town, etc. Muchas Amor! ? it was fun to read this Ashlee! Reading this and remembering the fun times we had while we are together in Mexico will always be something that I will cherish. I also know your momma Rena was in the temple with us. The whole experience was epic. 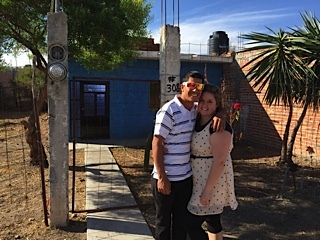 You and your husband will make a big difference there in Mexico to the people that you live around. As you stay happy I’ll be happy. I LOVE this!! Can’t wait to hear more about your life adventures! Congrats again! Ashlee, miss you! It was so great to be there and check out your new stompin grounds. Enjoy the stars from your hacienda….LUCKY! Love yas.